If A School Becomes A Shelter In Puerto Rico, Where Do Students Learn? 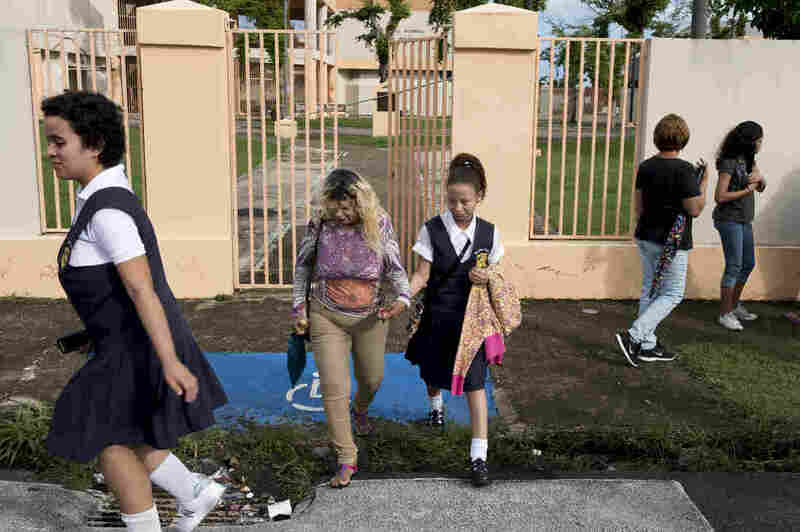 : NPR Ed Some middle-schoolers are returning to class for the first time since Hurricane Maria hit the island in September. The students are sharing a school with high-schoolers, and that worries some parents. If A School Becomes A Shelter In Puerto Rico, Where Do Students Learn? 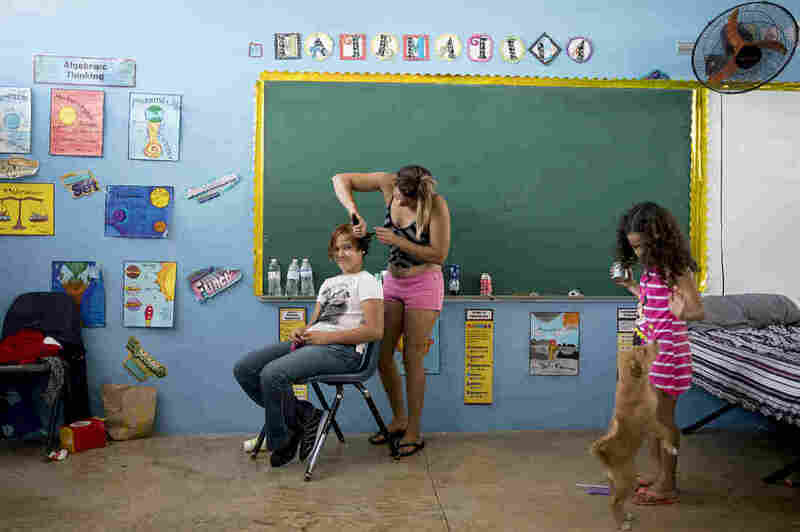 Lilian Garcia braids Melody Vasquez's hair while Garcia's daughter Jaohnliz plays with her dog, Fanny, inside Liberata Iraldo, a middle school in Rio Grande, where they sought shelter after Hurricane Maria. A jittery group of middle-schoolers is about to start the first day of classes since September, when Hurricane Maria slammed into Puerto Rico and totally disrupted the island's school system. The vast majority of the island's public schools — more than 98 percent — are open for at least part of the day, according to Puerto Rico's Department of Education. But a small number of schools in Puerto Rico are still not holding classes. Before today, that included the students of Liberata Iraldo. The middle school building they usually attend is being used as a shelter for people who lost their homes in the storm. 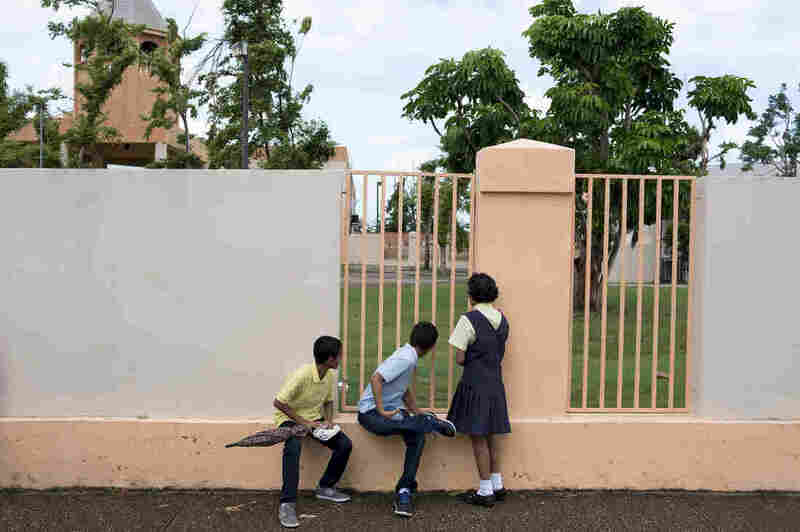 Because of that, these students, dressed in their pale yellow and blue school uniforms, are about to start class at a nearby high school — Pedro Falu Orellano — in Rio Grande, east of San Juan. The relocation has upset some parents, but the plan is moving ahead because it's not clear where the people living in the shelter will go next. The past several weeks have been tough, with so many kids stuck at home until now. Many students say they've been bored, reading and playing. The area is still without power. It's not clear why it took more than two months to determine a relocation plan. Eleven-year-old Angelisbeth Maldonado says she hopes there will never be another hurricane. "I don't like going to new schools, and learning lost material will be difficult," she says. Her family learned she would be starting school at this new location just the day before. It's supposed to be temporary. Nearly 500 students are being relocated from the middle school. Less than a mile from the high school, mother Nadgie De Jesus is rallying with several dozen other parents, students and teachers in front of the middle school turned shelter. She is frustrated that her daughter's school is one of just three on the island still being used to house storm refugees. And she refuses to send her to the high school because she thinks it's unsafe. "We need our school back. That's why we're here," she says. Her daughter, Kaylani, says she feels sad and misses her science and music classes. "I want to see my school again," she says. Puerto Rico's secretary of education, Julia Keleher, says that officials are trying to find solutions for schools across the island that have not yet been able to open. Keleher says she is not completely happy with the quality of education some students are receiving, "but," she says, "schools are open and there is teaching and learning that's happening." At this new location, the middle and high school students will not overlap in hours, to avoid conflict, says regional director Sol Iris Ortiz Bruno. "After carefully analyzing all factors to be considered, like adequate space, reasonable distance and school security, it is clear that Pedro Falu [high school] is the best choice," Bruno said in a statement. He added that once Libarata Iraldo ceases to be a shelter, "both schools will return to regular operations." Middle school teacher Noelanie Fuentes says she keeps hearing different dates about when the school will stop functioning as a shelter — the latest word is Dec. 15. She worries where the people sheltering there will go next. Students peer through a fence at Liberata Iraldo. 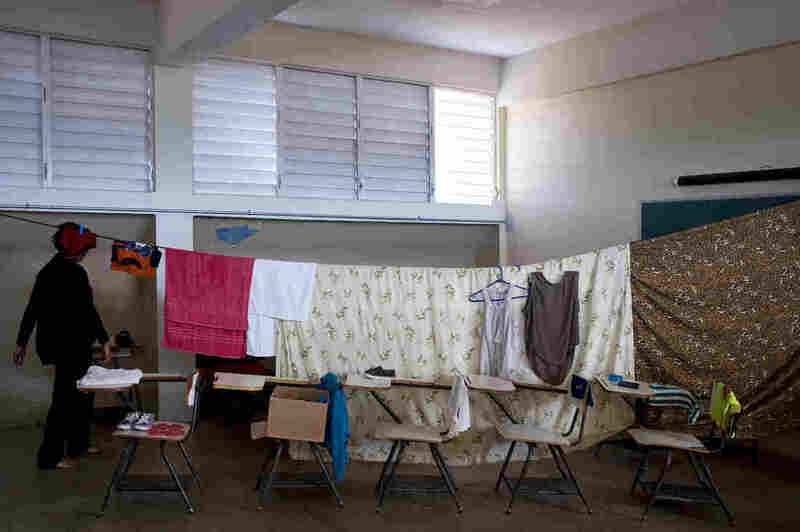 The school has remained closed for 79 days since Hurricane Maria devastated this Caribbean island, displacing residents. "I don't want them to be thrown out on the street with nowhere to go," Fuentes says. 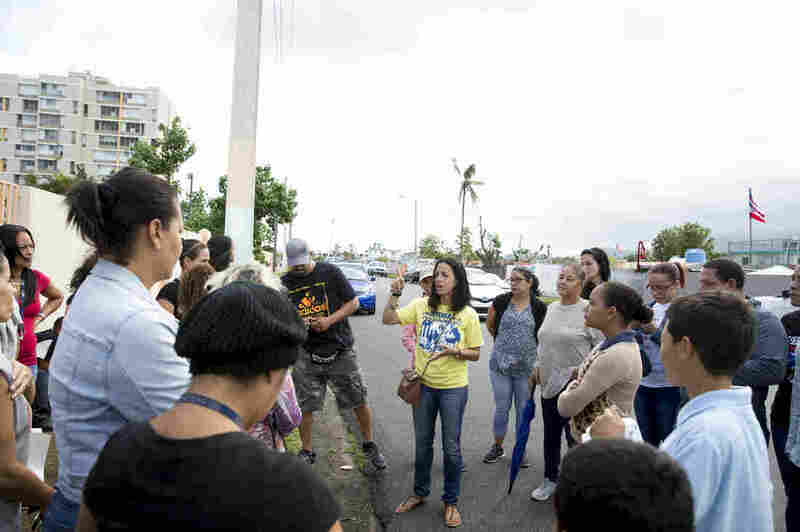 In addition to three schools turned shelter, there are currently about three dozen other shelters operating in Puerto Rico. The shelter at Liberata Iraldo middle school is hosting nearly 50 people — many sleeping in the classrooms. Stephanie Garcia is one of them, sheltering with her husband and 4-year-old son. The family came here after floodwaters destroyed their home, she says, and looters made off with their remaining possessions. They lost their car, too — which meant her husband lost his job. 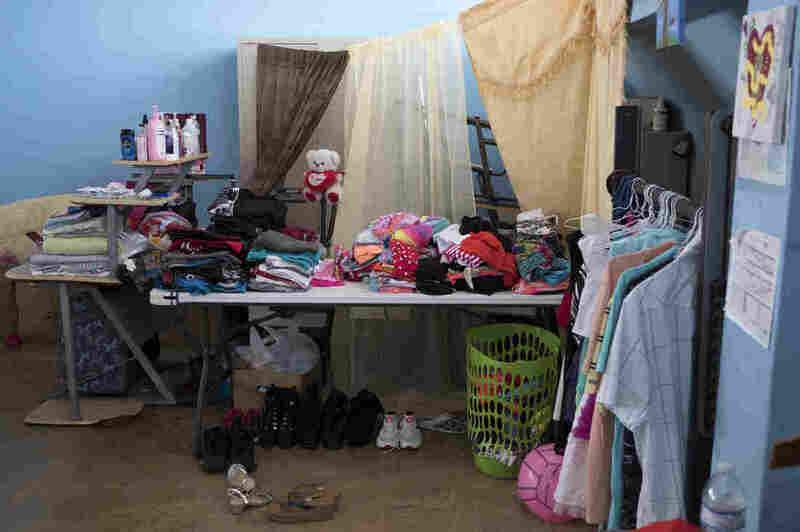 "We have coped with living in these conditions, for the moment at least," she says. Their clothing dries on a line stretching across the classroom, where desks sit in a corner. They pushed several cots together to make a bed. Garcia says that as a mother, she understands why parents want their middle school reopened. She says her family is happy to relocate — they just don't have anywhere to go.